I'm new to this site but have had acne for about 3/4 years. I'm 15 years old and currently I wash my fave twice a day with The Body Shop Tea Tree cleanser, then toner and a simple (as in the brand) moisturiser. 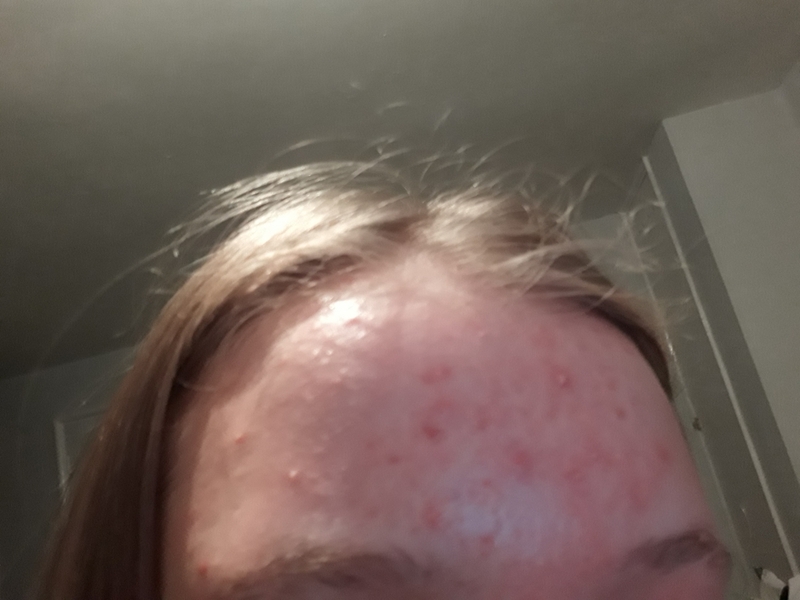 In the past I have used Clearasil, freederm, Clean and Clear etc, and recently tried an Acnecide benzoyl peroxide gel but it did not go very well. I eat at least 5 portions of fruit and veg everyday and do not eat meat, I do eat crisps and other junk food but I honestly don't think it affects my skin, at least not for me personally. I drink 2 litres of water and I don't understand how I can help my acne?? I've tried so many different creams and gels but it's likely that hormones are to blame as I am a teenager. What could I do to help this? 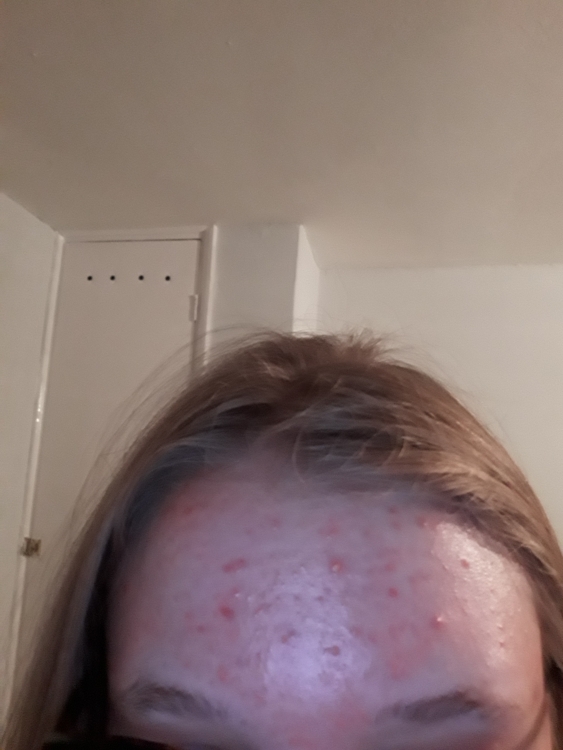 Also as you can see from the pics (which are very bad quality sorry lol, also excuse the big white head I'm hesitant to pop at the moment) my forehead is the worst area but I usually get a few red+painful spots on my upper cheeks too. Hey, have you also cut out dairy? This could be a huge trigger in some people. I can see on the pictures that you have a bit oily skin, I would recommend to use aloe vera during the evenings to lessen the oily texture. Also to exfoliate 1-2 times a week with clay mask or lactic acid etc. I would also just try either BP or tea tree oil, choose one you like the best, stick with it for 8 weeks, if no results then switch to another serum. 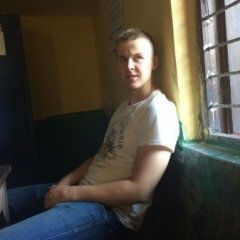 There could be many reasons as to why you’re breaking out but here are some things I have learnt from personal experience. Try not to pick or pop blemishes. This is really important! You’re young and popping and picking the skin could result in scarring. As tempting as it is, try to avoid touching your face. This includes picking as well as leaning or resting your hands on your face. Always cleanse hands prior to cleansing or applying treatment or moisturiser. Since your breakouts are mainly on your forehead it might be a good idea to look into the type of shampoo/ conditioner or hair products that you’re using. If you choose to wear makeup, make sure to remove all makeup properly at the end of the day. Make sure to also wash makeup brushes/ sponges frequently. Treat your skin with kindness. Maybe incorporate some sort of aha or bha into your skincare routine. Overall, you’re young and experiencing breakouts is very common. It’s likely your breakouts are due to hormones which can be really difficult to treat. If you don’t see any improvement, I would strongly suggest seeing a doctor or professional that could give some guidance and assistance. your probably right in regards to hormones being your problem, so might be hard to treat at the moment. if your lucky, you might grow out of it. i would recommend researching as much as you can about acne, acne products, diet & acne. - while you can learn what you can do to treat your skin, its also worth knowing what can make your problem worse. I want to share with you my routine which saved my skin. I double cleanse all the time as a regular cleanser doesn't really clean make up and sunscreen. For active pimples - COSRX Acne Pimple Patch - best invention ever, I swear by it. I find Benzoyl Peroxide too harsh on the skin and creates more breakouts. The drier your skin, the more your oil glands produce oil so you have to balance it out.